'Onement VI' by Barnett Newman was sold at Sotheby's Impressionist and Modern Art for $43.8 million on May 14, 2013. (CNN) – Earlier this month in New York, the two renown art auction houses, Sotheby’s and Christie’s, both had record setting sales. At Christie’s, one of Jackson Pollock’s iconic drip paintings “No. 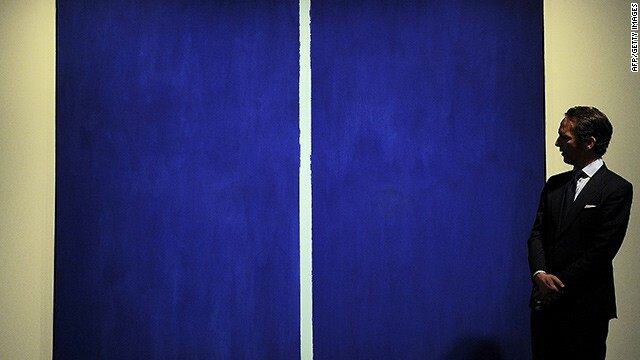 19, 1948” was sold for $58 million, which crushed the painting's previous sale in 1993 of just $2.4 million. Works from 12 contemporary artists like Roy Lichtenstein and Jean-Michel Basquiat, sold for record prices. The sale of postwar and contemporary art at Christie’s totaled $495 million – the highest sales figure at any art auction.